Guess what, folks. I’m about to blow your mind with what you already may know or at the very least suspect somewhere down deep, but what I think is important to talk about. Especiallllyyy in the blog world, especiallllyyy in college, especiallllyyy in today’s culture. I want to talk to you about dieting. About exercise. About “lifestyle changes,” because we all know that dieting and exercise are out of vogue. Diets don’t work, the experts say, and rather than force ourselves to exercise we are encouraged to find fun physical activity and delicious healthy food so we don’t have to diet. And around this new trend, dozens and hundreds of blogs (and a whole web and non-web based health culture) have popped up, including my own. It’s called Pilgrimage of Health, for goodness sake. Health. With Healthy recipes and Healthy lifestyle tips and Healthy thought processes and Healthy healthy healthy. And I’m not out to bash any of that. We do need lifestyle changes. We do need to forego dieting, and find activities that we enjoy doing that make us feel good, because we’re facing a crisis situation. In my country of the United States and increasingly around the world, we’re facing an epidemic of unhealth in mind, body, and soul. We’re spending more and more time and money and energy on health, and yet collectively we’re still pretty sick. In response, we’re inundated with lifestyles and ideas and tips intended to transform us into healthy, happy, carefree health goddesses (and gods). But I think, underneath a lot of the healthy language and healthy blog culture, we sometimes use health as a cover-up. As an excuse, to try and change ourselves into what we think we should be rather than accepting ourselves for who we are. Now, rather than esteeming thinness for thinness sake and dieting and weight loss, we’re instead consumed by this image of health that can lead us into unhealthy behaviors. An obsession with health can be unhealthy. Part of the problem lies within the motivation behind strict workout plans and eating regimes, but part of the problem can come after. After we’re following the cleanest diet, practicing yoga six times a week, training for a marathon. We become dependent on these as something to define us. We become human doers instead of human beings, fixated on the high of pushing ourselves further and defined by what we don’t do, that is, consume ‘bad’ foods (which in our society can mean a million different foods). And if we’re embracing a “healthier lifestyle” out of a deep dissatisfaction with who we are, I think that’s problematic. Because our bodies know, right? Our self knows. It knows when we act out of insecurity instead of satisfaction. We know, deep down, what actions come from abundance and deprivation. And that doesn’t come without consequences. Lying to ourselves and saying that we’re “just following this eating plan because I feel tired (or want to be healthier or save the planet or I think I’m allergic to . . .)” when we really are trying to follow a diet without calling it so because we are deeply dissatisfied with ourselves and desperately want change, our bodies and souls know. Don’t try to trick them. I know this to be true, because I do it. Have done it. Mastered it, for the past five years. I’ve been vegetarian, vegan, dairy-free, nut-free. I’ve followed strict running plans and done juice cleansing. I’ve committed to abstaining from this or that because of that and this. And every time I eat a certain way or exercise out of a dissatisfaction, it backfires. Badly. This is not to say that running or vegetarianism or veganism (or yoga or paleo or grain free or . . . you get the idea) are inherently bad within themselves. Nope, because those things can come from a place of true health. They can come from a place of wholeness, a clarity in communication with our deeper selves that says that running makes our bodies feel good or a certain type of food makes our bodies feel bad. Check yourself before you wreck yourself. If you’re eagerly about to jump into another trend in the name of health, step back. Why are you about to embark upon this plan? Is it from abundance, or deprivation? Joy, or insecurity? My dear friend, mentor, and older sister sent me this quote yesterday based upon a conversation we’d had earlier this weekend. She called to “check in,” on the pretense to make sure I was feeling better after she got me sick two weekends past. After a few minutes of talking, she revealed that, while she was concerned about my physical health, she was concerned more about me. Now, let me give a bit of background to her older-sisterly consideration. Two weeks ago, my sisters and I went out to see the baby. THE BABY, folks! 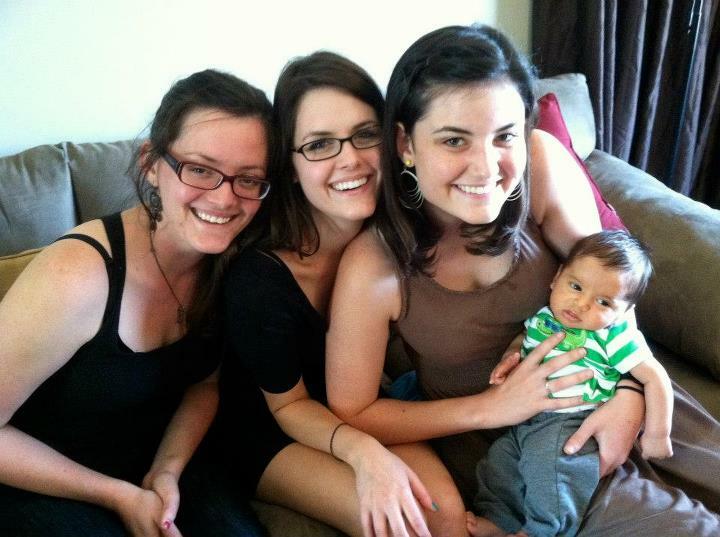 It was the first time I had met my precious, precious nephew, and the first time the four sisters had been together since THANKSGIVING. As excited as I was (which, believe me, was a dramatically squealing level of anticipation) I approached this weekend with some consternation. As much as my big sisters are all the above and more, I’ve had a history of comparing myself to these wonderful ladies. Throughout a bit of my life, I’ve looked at myself in terms of my sisters. Am I as pretty? Creative? Smart? Driven? Am I as exotic or sweet or loved or kind or sought after? Part of which is natural, part of which is just plain toxic. So I approached that weekend away with my sisters mindfully, carefully. This summer, I’ve made it a practice of letting my emotions be. I don’t try to reason them away or invalidate them. Neither do I let them control me with undue power, swaying me to their whims. My emotions are allowed to be: I look at them, examine them, and pause to wonder at what is flooding through my mind and body. Then, I evaluate them: why do I feel this way? By allowing my emotions to be, I’m not forced to try and deal with them. I’m not trying to force them away, cover them up, replace them with happier feelings. In the past, when I encountered bad feelings, the methods I used to try and make them go away usually just intensified whatever darkness I was feeling. I am not the sadness that sometimes pervades me. Nor am I the ecstasy, the desire to withdraw, the overwhelmed, the happy, the gleeful, the enthusiastic, the stressed. I am the peaceful observer. I accept what is, looking forward to the future while living into the present. I think part of what my sister picked up on was that quiet introspection of what is. There is a quietness and seriousness that accompanies me when I tenderly look within at my emotions, feelings, desires and foibles. Do not be overwhelmed by what is, friends. Remember that you are the observer. You are the peaceful one, able to choose what you will allow in and what will flow out.